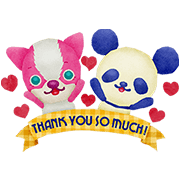 http://www.line-stickers.com/ – New Friends ★ FLIP-kun and FLOP-chan Line Sticker | Say hello to your new friends from San Francisco! Fresh from OLD NAVY, FLIP-kun and FLOP-chan are looking stylish in their trendy new clothes. They’re also ready to try out Japanese phrases on you and your friends! Friend OLD NAVY’s official account to get this stickers for free. Available till August 10, 2015.